With the various customization option available within OneDesk, you can configure the software to fit your needs and organization’s terminology and branding. 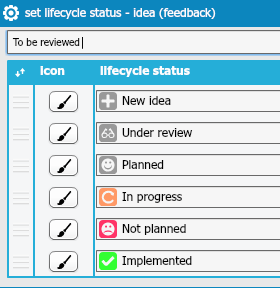 Feedback, requirements, issues, tasks, questions, compliments, and leads in OneDesk all come with a set of default lifecycle statuses. OneDesk’s automation engine triggers different project statuses and workflows based on which project status is set; this helps bridge the gap between executives, QA, engineering, sales, marketing, product, customers and external business partners. Both workflows and lifecycle statuses can be customized to fit the way your organization works, no matter how simple or complex your processes are. You can choose to customize the forms which users must fill out when creating an item in OneDesk. Forms can be configured to include additional fields such as detail, category, assignee, priority and product. This allows you to gather more information as the items are created, which saves time. Control what users have access to within the system by choosing which user role to assign them. If you don’t like any of the preset user roles, you can create your own and specifically choose what your team members can do within OneDesk. Customize your customer portal and a positive customer experience. Choose one of our preset themes which Facebook-inspired one, skins, colors or screen sizes that match your branding and website. You can also design your own. Custom fields allow you to set properties in order to be able to classify items and have an easier time searching for them. Custom fields can be created at the organization or project levels. You can also create custom fields for the customer portal so that customers can categorize their items as they submit them. This eliminates work on your end.